A year ago, after three games, the Raiders had only one victory to show for their efforts, had been beaten very soundly in their first two games, and would go on to win only three more games for the entire season. This season, under Brunner, who was elevated to head coach two weeks after the resignation of his predecessor, Mo Dixon, the Raiders have rebounded to not only a 3-0 mark, but to a No. 8 ranking among the elite in Class AAAAAAA football. To be sure, the fact that 17 starters returned from last season’s edition of Raider football has had something to do with the turnaround. Nothing like experience to be sure. But Brunner, who had been at Walton since 2014 and served as the defensive line coach and special teams coordinator on the 2016 staff, believes that the program’s “Core Values,” as he called them, have been most instrumental in the reversal of Raiders’ gridiron fortunes. The 33-year-old Brunner, a 2002 graduate of Roswell High School, was a four-year starter as a defensive lineman at Rhodes College in Memphis, TN, began his coaching career at LaGrange College, in that program’s inaugural year in Division III, before spending one year as special teams coach and defensive coordinator at Centennial, and the next five years at his alma mater, Roswell, as defensive line coach and defensive coordinator. 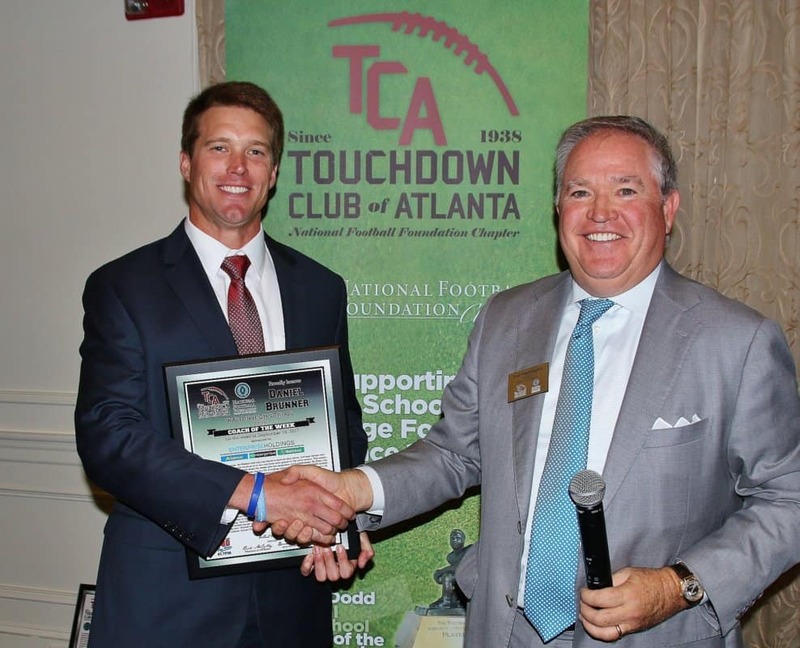 Brunner hopes to have as much positive influence on the lives of his student-athletes as the men who coached him at Roswell: Tim McFarlin and two Hall of Fame coaches at that school, Ray Manus and Pete Poulos, he made that saliently evident. Married for six years, his wife, Angela, is the head lacrosse coach at Lassiter. The couple has two children, Daniel Charles, age 4, who is called “DC,” and a daughter, Charleston Grace, 3.